We are truly saddened to tell you that at the age of 12 years, 7 months, Bullet succumbed to prostatic cancer on June 5, some three months plus after a differential diagnosis of his condition. 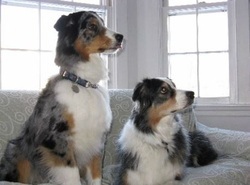 Bullet was a joyful, jaunty, playful and incredibly loving Aussie and a central member of our family. With kind, palliative care from his vets, Bullet enjoyed “bonus time” well beyond the month to six weeks typical for the disease to run its course - and he remained comfortable, active and engaged with family to his last day. After a truly difficult early morning on the 5th, Felicity took him to the local emergency vet who had followed him closely for the last two weeks, where they made Bullet comfortable and all awaited Jim’s arrival from two hours’ distant. Once again, Bullet just lit up as Jim entered the room and after some quality time together, we stroked, kissed and held our beautiful boy as he was put to sleep. fully give his heart and soul to a new family. At age 8, he found his way to a magical two hundred year old log cabin farm house in Canada near Niagara Falls, where he enjoyed an extended stay with wonderful ARPH foster parents and a menagerie of Aussies, Corgis, cats and house rabbits. He was particularly devoted to his foster mom and she to him, but they had recently adopted Mollie and so could not keep Bullet as their own. farm. Katy and Maia remained in our van, while Jim went into the log cabin home to meet the foster family. Three cats and corgi greeted Jim as he sat in their parlor and made us feel at home. Foster mom brought Bullet in while Jim was sitting on the floor engaged with the cats. Bullet immediately strained at his leash, then calmly walked over to where Jim was sitting, placed one front paw on Jim’s right shoulder and the other on his left and began gently licking his face, as if to say: “I know you - and I have been waiting for you - you are my particular person and it’s about time you got here - whatever took you so long?” Katy received a similarly warm greeting when she came in. We brought in Maia and the dogs showed considerable enthusiasm in greeting each other - we let the dogs out into a fenced yard together, and we knew the dogs were getting along when we heard excited cat noises, much barking and chasing and visually confirmed that the two dogs were acting in tandem as they played with (attempted to dismember) one of the family cats - and that settled that. her his bear with an affectionate nudge, which became his signature mode of greeting. arrival simultaneously signaled bedtime and the issuance of two delicious Tums to each. Bullet was also Maia’s devoted companion until her passing in 2012, and he was an attentive, mellow house mate to farm-girl Oreo, also adopted through ARPH in 2012.
open cushioned crates and multiple dog beds, he and Maia never were possessive - just used whichever was available - unless they were happily ensconced on our bed! epileptic seizures which alarmed us greatly but, strangely, did not persist. Always handsome and graceful Bullet, R.I.P. (Run in peace!! ).